Today was the wake-up call to all of us who have been in denial about winter coming. I myself was enjoying the fall weather and I especially love the golden light at this time of year. Today, however, we have had high winds and SNOW!!!! There are about 3 inches on the ground of the white stuff--geez, it's not even November yet. And I doubt if many towns have outfitted the plows and salt trucks. But it's supposed to be in the 50s on Friday. 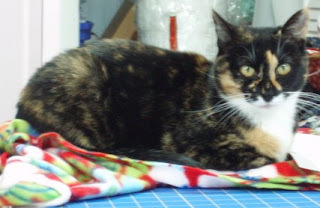 Callie has been trying to help more often in the sewing room--specifically on my cutting mat--often while I am trying to rotary cut. In self defense, I brought a remnant of fleece and put it on a corner of the island. She loves it there and makes fewer forays into the danger zone. She can also look down on Lynnie, who hates that she is up so high. On Saturday, Lyn D. brought in her finished Friendship Quilt. She started it in a class with me and finished it with her own machine quilting. Because she cannot decide which way to hang it, she put sleeves on both a long and a short side--that's versatility! It's absolutely beautiful--great job, Lyn! Last night I did a trunk show for the Twilight Stitchers in Mattydale, New York. What a wonderful group of ladies, and they were kind enough to invite another guild to join them for the evening. I knew several of these ladies, having taught at their guild (remember the disco ball? It's that group!). Proving yet again that quilters are caring, special people. I had a great time and I think they all did too. Plus, they came up with the most potential names for one of my quilts. What a way to start the week! Did you thread your needle today? Or do something equally as nice for yourself? Til next time--stay safe---and warm! In case you haven't figured it out yet, I love hand piecing. It is portable and easy, and you can achieve excellent results with even the hardest patterns. Here are three hand-pieced Mariner's Compasses. First photo is of Sandy's wintery compass. She has plans to expand a feathered star top she started a while ago and is making compasses to help that plan along. Next is Flo's black, white and red beauty! How striking! 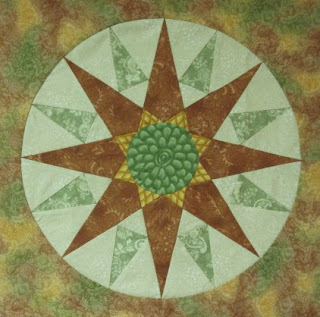 She has the completed compass basted for hand quilting. 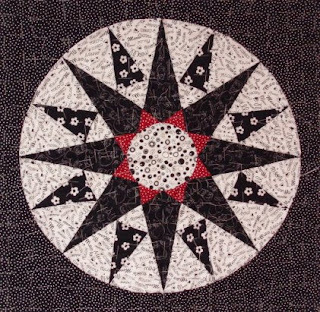 Can't decide what colors to use for your next quilt--how about black and white with a touch of red? It sure is eye-catching! Robin's color palette is soft and pleasing. The design on the circle will be wonderful to quilt. And the color placement makes the compass look like it's traveling toward you. Great job! 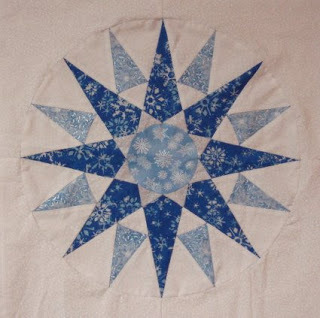 And last for tonight, this is Cathy's Monthly Bliss 1 quilt from several years ago. She made 25 blocks and set them on point. She had it machine quilted and it is just beautiful. All four of the ladies are involved in additional hand piecing classes with me this year. Proving yet again that one can never have too much bliss--hand piecing bliss, that is! Did you do something great for yourself today? Did you take time to just breathe? Only you can make it happen! Give it a try! 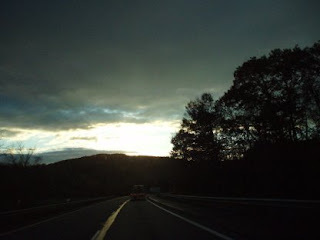 Last Wednesday and Thursday I spent in northeastern Massachusetts. On Wednesday the weather was sunny and warm and the leaves were spectacular. That night I did a trunk show for the Concord Piecemakers, after dinner with Fay, Janet, and Suzanne. Their vendor for the evening was The Woolpack yarn shop--with sock yarn! No, I didn't get any--but I did find the shop on my way home the next day! Since I was only about 20 miles from Lowell, I decided to drive there and visit the New England Quilt Museum. I had been there once before and loved it--and loved it again this time. The exhibit is MetroTextural, with contemporary quilts by the Manhattan Quilters Guild. I was impressed with the diversity of techniques used and the variety of subject matter present. 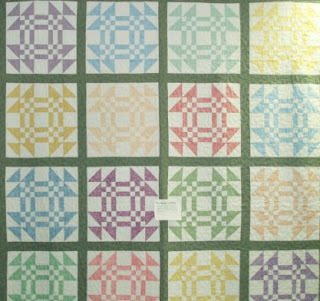 I was especially taken with several quilts by Beth Carney. Her "City Pulse" quilt was one I would have loved to own. Ludmila Aristova had several pieces that presented the city skyline in such detail that you felt you were there. No photos are allowed, but one of the pieces from the exhibit is used on the NEQM's website. If you get a chance, be sure to visit the Museum. 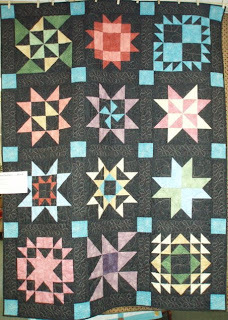 For those of you who prefer the more traditional quilts, there are several from the permanent collection on exhibit at all times, and the ones that are up now are wonderful. There is an "Album Summer Coverlet" from c. 1850 that is intriguing--so much to see and in such detail...it holds you captive for quite a while. As I came out of the museum it started to rain quite hard, so my walking tour of downtown Lowell was scrapped. 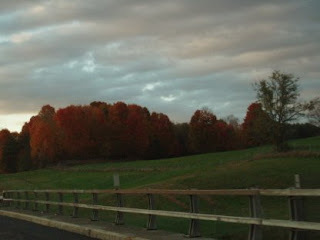 For your viewing pleasure this time, here are pictures of fall foliage and skies taken on my trip home. And, now, the coincidence part of the story. My brother drives tractor trailer and we have never been anywhere at the same time. Until Thursday! He delivered in Lowell, MA, the day that I traveled to Lowell (from Concord) to go to the museum. We arranged to meet at State Line (the first west bound exit in NYS) and have dinner. As the fates would have it, there is no diner there now, so we headed on west. We eventually stopped at a Thruway Service Area and had dinner. It was the perfect ending to a perfect day. (I forgot to tell you that on the way to State Line I did go to The Woolpack and did, in fact, buy yarn. But not for socks!!!) So I followed him all the way back to Syracuse where our paths diverged. What are the odds that we would both be out separately and end up in the same town a state away? I enjoyed every minute of it! That's it for now. I'm going to do a bit of quilting today and also try to get my desk unloaded again. Why is it that any flat surface becomes a paper collection site?!?! Remember "Sock Gone Bad"? Well, I refused to let this yarn get the best of me. So I went down one needle size and started the ruffled socks again. I was almost to the toe once again when I wanted to rip them back out, but...I didn't. I decided that someone could use these socks and it was foolish to have almost half a pair done only to rip it out. I stuck with it and here are the results. 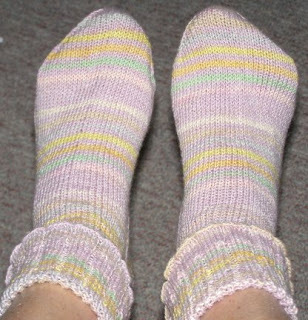 A finished pair of ruffled socks. Here they are laid flat, along with my second "Wee Sock". (Somehow I misplaced my first wee sock and felt compelled to knit another one in the same yarn!) I'm still not sure exactly why I don't like this yarn, but I would think long and hard before knitting with it again. But it did not beat me! I presently have a pair of bulky yarn socks on needles for my brother (don't tell him!). On size 8 needles they are going really fast--only 40 rows for the cuff and I have the heel flap done. 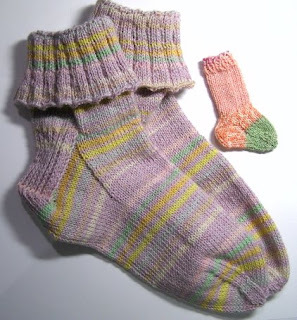 I also have another pair of wool socks on needles--I am absolutely swooning over the yarn and pattern. I'll share more on them in another post. Back to the quilt show. When the guild decided that they wanted to do a pieced raffle quilt, they asked me to do classes on their chosen block to make assembling the blocks and quilt easier. Most finished their practice blocks into finished pieces. Barb A. set her block on point, added a small border and corner triangles. The colors are warm and inviting. Ginny D. made a Missouri Puzzle variation of the Goose in the Pond block (top), while Barb T. used the traditional block for hers. 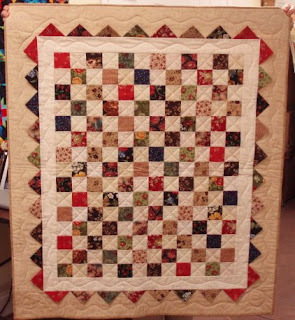 Jan H. liked the block so much that she made an entire bed-sized quilt with them. Finishing at 15", it doesn't take many blocks to make a decent sized quilt. Adding sashing and borders (not shown) finished the quilt beautifully. 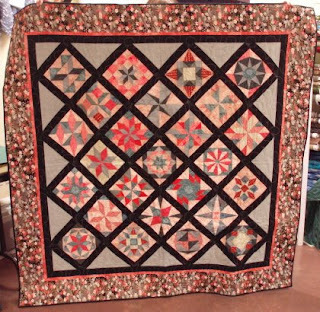 Nancy C. (remember her star quilt last post?) floated the block and then floated the entire center. Strong contrast really sets this block to advantage. 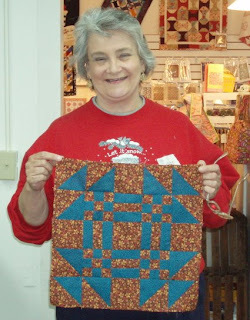 And last, but not least, Barb T. started this Thimbles quilt in a class with me earlier this year. 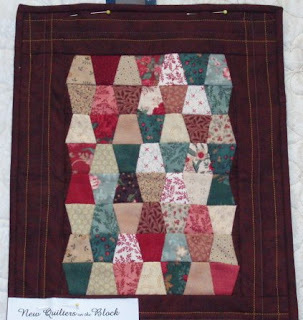 The center is hand pieced and Barb machine quilted this small gem. The raffle quilt was done in shades of blue and was absolutely gorgeous. Unfortunately, I apparently did not win, as I did not get the call--but whoever did win has a quilt to treasure forever. Congratulations, ladies, on a great show and on doing me proud! I'm off to Concord, Massachusetts tomorrow to do a trunk show. 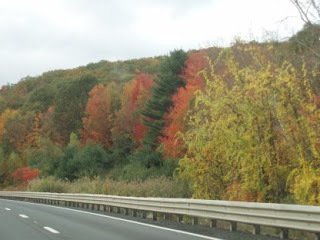 I'm hoping the leaves will be breathtaking on my way to and fro. A short side trip may take me to Lowell to the New England Quilt Museum and of course to any quilt shops that I can find. I know we quilters are doing our best to keep the economy going...if only the politicians were quilters! Til next time, take a few stitches and breathe easier. Having been properly chastised (several times) by "Annoying" (you know who you are!!! 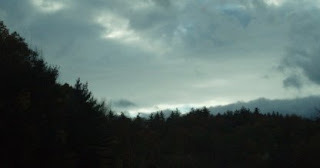 ), I will make a more concerted effort to update the blog more frequently. I didn't realize how much you missed my ramblings when I am absent! So here we go! First up is A.J. from Pennsylvania, who traveled to O'Susannah's in Watkins Glen for Monthly Bliss 2. She finished her top over the summer and look how beautiful it is! Using only fabric from her stash, A.J. was concerned that she wouldn't have enough of her border fabric. Her luck held and she was able to not only get out her borders but to miter them as well! She said she only had about 4 inches of fabric left--that's close! A.J. is back for Hexagon Bliss this year and her fabric selections are equally stunning. On October 6, also at O'Susannah's, I taught the Goose in the Pond block as a skill builder. Students learn what I call the Big 3: Cutting, piecing and pressing. You need all three to get good results. Claire B. completed her block in class--the dark brown and turquoise fabrics were a wonderful choice--and her block measured exactly 15.5 inches unfinished! And her points were perfect. She has good reason to be smiling so broadly--great job, Claire! On Saturday, I was able to visit the New Quilters on the Block show in Candor, New York. 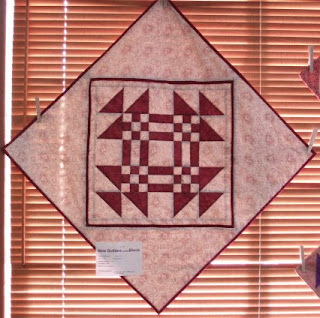 It was wonderful to see so many quilts that I had seen started in classes. Usually teachers don't get to see the final results--so this was a special treat. I will have more pictures from the show in the next post. 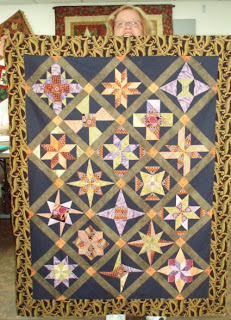 This is Nancy C.'s "Star Sampler" quilt--all grown up and finished. This was a 10 month class at Pucky Huddle Delight in Candor, where students learned to properly rotary cut and precision machine piece. 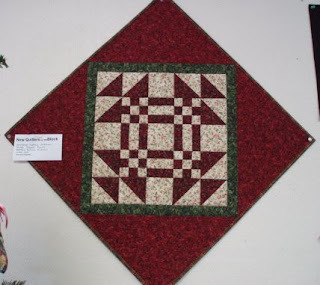 Nancy chose not to add a border, instead letting the blocks float, with the sashing and background matching. 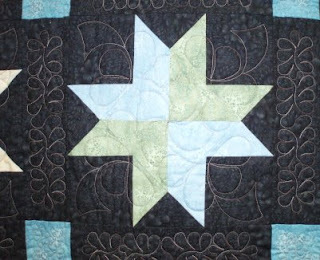 Here is a close-up of the quilting on one of the blocks. Nancy is making two quilts for this year's Southwest Sampler, one of old-fashioned brown and navy, and one in purple batiks. Both are so striking. On the right side bar of the blog, you will notice a couple new things. First, you can subscribe to my blog and receive notification when I update. Also, I have started a list of blogs that I regularly frequent. This also tells when they recently updated. I will continue to add to the list, but these are blogs I try to visit every day. What do you like best about reading blogs? Are you looking for information or just entertainment or a little of both? 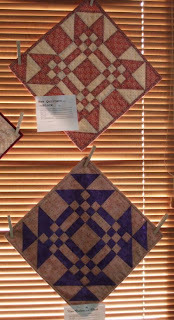 Next time, more quilt show pics and a look at perseverance in action. Remember to do something good for yourself today--you're worth it!